FileThis makes it easy to locate the documents you need in FileThis Cloud—and then get the information you need out of those documents. For example, you might need to jot down an account number, check a detail in a contract, or confirm that you found the right receipt to return a gift. 1. Click the Documents tab to view documents. 2. Double-click a document’s name or thumbnail, or select a document and click the View button in the upper-right corner. 3. When viewing a single document, you can zoom in or out, navigate among pages, change a document’s file name and relevant date, and view the next or previous document. Previous, Next: Click the Previous or Next button to display the document before or after the current document. Scale: The Single, Two-Up, and Thumbs buttons control the display of multiple pages within the current preview area. When Single is selected, the Fill Width and Fill Height buttons fit the document to the available preview area and the slider lets you zoom in and out of the page. Navigate: The third row provides standard controls for navigating pages, from left to right: first page, previous page, page number field, next page, last page. Rename: If you rely on the document name for searching and sorting, you might want to change a document’s name. Click the pencil icon next to the document’s name, enter a new name in the field, then click Rename. If you need to find out a document’s original name (for example, to find the file on your computer), you can click Revert to Filename. Kind, Size, Added, Created: FileThis lists helpful information about the document below the document name. Relevant Date: When a document is uploaded, FileThis assigns it a relevant date based on its content (for example, a cellphone statement for April 2013 would likely be assigned the relevant date of April 2013). If FileThis cannot determine a relevant date (for example, for your child’s artwork), the file creation date is used. You can change the relevant date by clicking the pencil icon next to it. Tip: You might, for example, change a document’s relevant date in the aforementioned example involving your child’s artwork. If you scanned the artwork, the creation date may not reflect the date your little artist created that masterpiece (a date that is no doubt etched on the back of the artwork in crayon). 4. When you’re finishing viewing a document, click the Done button in the Preview tools panel, or click the List or Grid button in the upper-right corner of the Documents tab. 1. 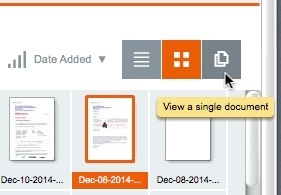 In the Documents screen, locate the document you want to view. 2. Click the document icon to display it full screen. Swipe to view additional pages. Use the top row of icons to (1) view single pages or thumbnails, (2) view document information, (3) search the document, and (4) delete the document. Use the bottom row of icons to (1) email the document, (2) share the document through various message systems, (3) view and edit cabinet information, and (4) view and edit tags. 4. When you're finished viewing the document, click the back arrow at the top of the screen.